The Jungle Book was the second film I ever saw at the pictures. And the fact that I’ve called it “the pictures” should tell you I’m not talking about the fancy schmancy CGI job from 2016, but rather the animated Disney classic with the great soundtrack. An appearance on Five Live (goto 50′, 15”) brought back memories of the film today when I was asked to talk about sports journalism and specifically the way England’s football team can swing from no-hopers to World-beaters with the successful conversion of a penalty kick. I was asked by Adrian Chiles why the press is full of unquestioning hope and support for the team (though I write this the day before their quarter final with Sweden, so things may have changed by the time you read this) rather than telling it like it is – more shades of grey than black and white. My answer was based on a conversation with some of my students before the tournament started, but finished with a Jungle Book analogy. About a week before the tournament started the students were talking about England’s chances in glowing terms; there was mention of a “quarter final at the very least” and more than one voice which thought they could make the final. Using my best “come sit by the fire and let me tell you about the old days kids” voice, I patiently explained that I too was once like them and that I used to believe that England would win a football tournament, or a penalty shootout at the very least. Giddy with the comparative success of semi-final exits in Italia ’90 and Euro ’96, I thought, as a young man, I’d be fed with a regular diet of England success and any tournament soon, I’d have a win to celebrate. But then came the failures to qualify, failures to get out of the group stage, the end of the “golden generation” of players and the penalty shootouts whose scars felt as raw now as they did then. So I ended up telling my lot to douse their dreams in reality and forget about England doing well. “Don’t make the mistakes I’ve made,” I said, a man who was now sure he’d end his days without ever seeing an England captain holding up the World Cup. But then we (and it’s definitely “we”) scored a last minute winner, we scored six against another team, alright, then we lost one but that, in its own way, turned out to be a win because it thrust us into the “easier” half of the draw. Then, with nerves and nails shredded, we even (I can’t believe I’m writing this) won a penalty shootout (cue “Hallelujah” music). You see, the scene where Baloo the bear and Bagheera the panther set out to rescue Mowgli from the monkeys says a lot about my support for the England team. I was Bagheera; calm, level-headed and not about to be carried away by the situation. 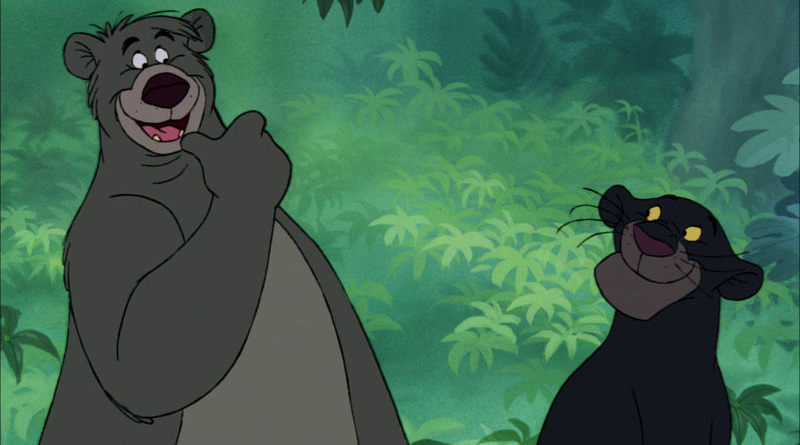 But England have turned me into Baloo and I’m wearing a grass skirt and coconut bra while sashaying into a situation where, unquestionably, I think England are going to win and everything’s going to work out fine. Ok, the soundtrack in my head is “It’s coming home” rather than the admittedly more catchy “I wanna be like you” but the effect is the same. I’ve changed. I’m hopeful. But most of all (and to quote the bear), I’m gone man, solid gone. ← Is it time to re-evaluate Jurassic Park?